Are completely automatic vertical modules that work in pressure til 7 Bars. They are composed by pressure containers in plastic reinforced by incorporated fiberglass and are controlled by a hydroelectric valve for the automatic regulation in the service phase, backwash and in equi-current washing. 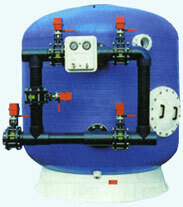 incorporated fiberglass with centralized valve of control. and a battery group of automatic valves. Quartz and anthracite are chemically inert and at disposal in selected granulometries for refined filtrations or for the elimination of iron and manganese previously oxidized(FQ seris). Manganese dioxide is a natural crumbled mineral without additives and suitable for the elimination of iron and of manganese from water using the catalytic oxidation (FM series). "Cullbon" is a granulated activated carbon with a mineral/vegetal origin and very high porosity particularly suitable for the absorption of smells, tastes and colours in water. It works particularly as a chlorine catalyst and on the organic macromolecules. The chlorine causes some unpleasant smell and the macromolecules cause unpleasant tastes (FB series). "Cullmite" is a semi-calcinated Calcium carbonate and Magnesium product particularly suitable for drinkable, acid or poorly mineralized water. This treatment permits the presence of a natural and spontaneous reaction of solubility in the consumption of Cullmite. This reaction is proportional to the water acidity (C02) with neutral salt as result (bicarbonate) which gives to water a neutral pH (FC series). The values of capacity are indicative and they could change in according to the features of the typology of treated water.